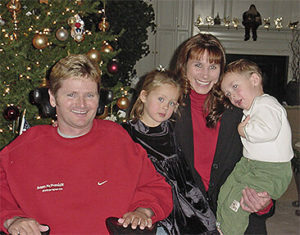 Sam Schmidt is to racing what Christopher Reeve is to horseback riding. No one can get behind the wheel of a race car or on the saddle of a thoroughbred without remembering the accident. Now, Reeve is the name to know when it comes to spinal cord injury advocacy. But Sam is emerging as a leader for game-changing paralysis research. Sam would likely use the common expression that he puts on his socks one at a time, just like everyone else, but that isn't true. 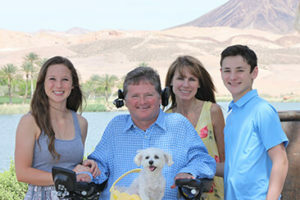 Sam has someone assisting him at all times due to his quadriplegia. (He also numbers his socks so they are adequately rotated and used evenly-a total Type A personality, he readily admits). Sam really is like a superhero in many ways. But Superman Sam isn't the man who finished fifth in theIndy Racing League point standings in 1999, nor the man who earned a career pole and victory atLas Vegas Motor Speedway. 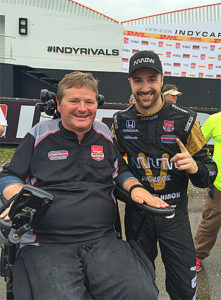 It's the man who woke up in the ICU after his car hit a retaining wall and now says he's "clearly helped thousands more over the last 16 years than [he] ever could have as a race car driver." That's not to say transitioning from the fast-paced independent life of racing to a suddenly dependent life as a quadriplegic was easy. The hardest things, he said, were "dealing with the ventilator and all of the side effects until we managed to get rid of that six weeks after the accident. After that, not being able to embrace my family." Even as Sam was forced to relearn how to do everything in life, he held onto his faith, his family, and his extended support system. "I can't imagine enduring an injury of this nature without faith that everything happens for a reason and that, ultimately, I will be dancing with my loved ones at some point in the future," Sam said. A quadriplegic dancing? It's not as far-fetched as you might believe. Sam knew of a company, Arrow, that created a race car that a low-level quad could drive and was excited. But someone like Sam, with no use of his arms or legs, needed even more technology to get him behind the driver's seat again. "The CEO of Arrow, Mike Long, says that technology is there to make people's lives easier. When you apply technological advances to products for people with disabilities, it not only makes their life easier, it changes their entire world and, hopefully, their ability to live longer, be a productive member of society, and accomplish personal goals," Sam said. Arrow worked with Sam to create the SAM Project-the Semi-Autonomous Motorcar. On May 18, 2014, Sam drove for the first time since his accident in 2000. Sam remembers someone saying, "If you want him to do something, just tell him he can't do it." Maybe it's his racing mentality. Maybe it's having survived a devastating accident or his active role in Conquer Paralysis Now. Maybe it's because Sam really is like a living, breathing Superman in his fight against his archnemesis paralysis. Or maybe the fight is in us all to become the drivers of our own destinies. We are honored to have Sam's vision and determination helping guide BraunAbility as a member of our leadership team. We can't wait to see where this superhero helps take innovation in accessible vehicle technology and paralysis research in the years to come. September is National Spinal Cord Injury Awareness Month. There are an estimated 200,000 people living with spinal cord injuries in the United States. In our country alone, a person becomes paralyzed every 48 seconds. Learn more here.